AFC Fylde goalkeeper Rhys Taylor admits his side just weren’t good enough at Brackley Town on Tuesday, when they crashed out of the FA Trophy 4-0 in a humbling replay. 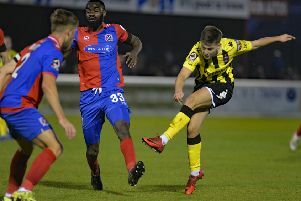 The Coasters trailed by three goals after a lacklustre first- half-display, and despite ringing the changes at the interval they conceded a fourth and struggled to find their usual firepower in front of goal. Dave Challinor’s Coasters lead the pack in National League North by seven points heading into the festive fixtures, but they have suffered early exits from both the FA Cup and now the FA Trophy. This was only Fylde’s third loss all season, following narrow 1-0 defeats at Alfreton in the FA Cup and at Tamworth in the league. “It’s the first time we have experienced anything like that this season,” added Taylor, “ so it’s important we put it behind us and move on. “It is happening week in, week out that I’m having to make too many saves in a game and it has got to change. “We have been very good this season, but we have been conceding too many goals and I think a result like that was coming. “You never like to lose any game because it’s good to keep momentum. There were a few changes to the team on Tuesday but the team the manager put out was more than capable of getting a result. Fylde have prided themselves on a strong defensive record over recent seasons but have kept only three clean sheets this term. And Taylor pulled no punches when asked why he thinks that is . He added: “I don’t think you can compare records from season to season because the players change and the league changes. Fylde travel to Gloucester City this Saturday ahead of the festive derby double-header against Chorley. And former Chelsea stopper Taylor insists it is time for a few of his team-mates to “stand up and be counted”. “Gloucester have given us a couple of tough games already this season and those are the kind of games in which people now need to stand up and be counted, especially after a result like we had on Tuesday. “People need to show some bottle now.